Ian Samson, EMEA Regional Training Specialist for DuPont, discusses the importance of choosing the right coverall and the correct procedures to follow when donning and doffing to ensure the maximum level of protection is achieved. Protective coveralls are intended to protect against contamination from hazards in your working environment, ranging from liquid and solid chemicals, oils, non toxic liquids and airborne substances, through to dusts and fibres. 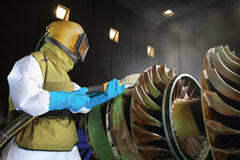 In some working environments, such as laboratories and crime scenes, protective clothing is required to stop human contamination of the area with hairs, shedding skin or clothing fibres. When selecting appropriate chemical protective clothing, several factors must be taken into account such as the type of task being performed, the nature and concentration of the substance used, but also the best possible balance between protection and comfort. While there are many protective coveralls available on the market, not all of them provide the same level of performance, even if they are certified for the same type of protection. There are a multitude of chemical compounds that can cause adverse effects on unprotected skin, from simple dermatitis to a complex variety of toxic effects. European CE categories for protective clothing differ in terms of risks and certification requirements - the higher the risk, the higher certification requirements are. A CE mark on its own symbolises that the garment is Category I; that is, ‘Simple design, minor risk’ - the lowest level of protection for PPE. The framework Directive 89/686/CE, however, stipulates that equipment used to protect against chemical and biological agents must be certified as Category III PPE, which protects against serious or irreversible hazards. The CE mark plus a four digit code of the notified body stands for protective clothing of Category III, e.g. ‘Complex design, high risk’. To carry the CE mark, Category III Chemical Protective Clothing must pass one or more of the garment ‘Type’ tests, meet or exceed minimum requirements for the fabric’s physical and chemical properties and be correctly identified and labelled. In addition, the protective clothing must be manufactured to a consistent quality, and the manufacturer must either hold a quality certificate, such as ISO 9000, or be subject to regular inspection by the notified body. With so many different coveralls on the market, how do you know which one is right for you? Even when garments are CE certified, the same certification ‘Types’ can provide wide differences in performance. The CE marking means that chemical protective clothing meets minimum performance requirements for liquid and constituent mechanical and barrier tests. This means that suits of the same ‘Type’ - e.g. Type 5, solid particles and fibres - will offer the same level of protection performance against those hazards. This is why it is essential to look at the results of the tests carried out on the material used to make the garment to ensure that you will be appropriately protected. 1. Hazard identification What is the hazard? Is it gas, liquid, vapour or particle? What are the levels of concentration, humidity and temperature? Are there any risks of heat, flame, or explosion? 2. Determine the minimum levels of protection needed Take into account the Type classification and examine the results obtained from the Type and material test as indicated in the manufacturer’s product documentation. Only by taking these detailed results into consideration is it possible to make conclusions on the levels of protection the garment provides. 3. Assess the hazard toxicity Knowing the toxicity or consequences of short or long term exposure to the hazard is essential. Assess whether a suit that just passes a certain Type is sufficient protection. For example, a suit designed to have higher exposure Type performance, such as Type 3 or 4, is likely to offer a much lower amount of particle inward leakage, particularly if additional taping is used, and will be a significantly better barrier than certain Type 5 suits that in some cases may just meet the standard. 4. Determine protective performance requirements of the fabric and seam Consider that liquid chemical penetration tests are conducted over a time period of just 60 seconds. In order to assess whether a fabric protects the wearer for longer exposure periods, the permeation data, gathered from tests lasting up to eight hours, should be consulted. 5. Determine mechanical performance requirements An excellent barrier is only worthwhile if it withstands working conditions and remains intact for the duration of the task. In addition, selecting the right size is essential to ensuring proper protection. Choosing the correct size is a prerequisite not just for greater safety, but also for greater comfort. Choosing the wrong size can have fatal consequences: if it’s too big it can get stuck in production machinery, if it’s too small it can tear or considerably restrict mobility. 6. Comfort considerations Protection is important, but so is comfort. Identifying the appropriate protective and mechanical performance while also maximising wearer comfort can contribute to wearer satisfaction and productivity. Key comforts frequently cited in wearer trials include freedom of movement, garment weight, the feel on the skin and breathability of the garment. 7. Supplier selection Protection, performance in use and comfort are key criteria, as is a manufacturer’s brand reputation for consistent quality. 8. Identify the correct usage of the product Be aware of product limitations as these can be a useful source of information on the correct use of the product. They may also raise important questions, such as whether additional taping is required, whether grounding requirements should be considered, the garment’s performance when exposed to temperatures and whether a doffing procedure is required that necessitates training to avoid contamination. 9. Wear test Once you’ve made a safe selection, putting a product to the test via wear trials is a wise step in the selection process to ensure it is the correct choice. Other key issues that should be taken into account when selecting protective garments include the quality of the garment, its convenience and user-friendliness, environmental compatibility - safe and cost effective disposal - and its cost, although it is not recommended to make a decision based solely on price. It is also important to note that with accessibility to global information it is possible to find products around the world. Care should be taken, however, to ensure that products selected conform to the correct product standards in the region that the coveralls are being worn. For example, protective coveralls approved for use in the United States will not necessarily conform to European legislation, and failure to acknowledge this could leave workers at risk. It is widely accepted that the more comfortable a piece of personal protective equipment is, the more likely the worker will wear it. Often, those needing to wear protective coveralls are wearing them on a daily basis and, in some situations, for an extended period of time. Manufacturers of disposable coveralls therefore invest heavily in the design and comfort of their garments. There are particular areas with protective coveralls that take more design consideration, such as the hood and neck area and the movement around the arms. Recent introductions to the market from experienced manufacturers include sophisticated hood designs that perfectly fit the contours of the face and neck, and therefore reduce exposure risk and increase comfort. Attention is also paid to sleeve design to ensure a perfect fit, even when arms are extended above the head. These design improvements mean that uncomfortable thumb loops are not needed and allow for greater comfort and flexibility. As often noticed by users in wear trials, garments designed this way are extremely comfortable to wear and provide greater freedom of movement. The design of protective coveralls is not just about comfort - they must protect too, and so increased focus is on ensuring these garments are easy to seal and seams are secure. Again, designs of recent coveralls include features such as a glued-in - rather than stitched - elastic waist to reduce the number of seams, giving it greater strength and less opportunity for inward leakages. In addition, fabrics used often maximise breathability and wearer comfort while offering superb protection. While you may not think too hard about how you put on your own clothing in the morning, putting on a protective coverall correctly is instrumental to the performance of the garment. Once the appropriate coverall has been chosen, a contamination-free changing room should be made available, away from the workplace for workers to get dressed. Any objects that could obstruct work should be removed from pockets and left in a secure environment. Begin by sitting on a chair and removing your footwear. Then, carefully put your feet into the legs of the coverall one by one, before putting on and securely lacing your safety shoes or boots. At this point you should put on the correct gloves for the application. If you are using two sets of gloves, put the first set on now. Standing up, pull the suit up to your waist and place your arms into the sleeves. Before zipping up the suit, put on any goggles or masks and ensure they are fitted correctly, are comfortable and there are no gaps. Pull the hood up over your head and zip the coverall to the very top, pushing the zip down to lock. If you are wearing a second set of gloves put these on over the first pair of gloves, covering the wrist and sleeves of the coverall. It is recommended that all gaps and joins should be sealed with adhesive tape, including the ends of the gloves and around the face where the hood meets the facemask. A colleague should be present to check that the suit is donned correctly and that all gaps are sealed. Unless great care is taken in the removal and disposal of single-use protective garments, there is a risk of cross contamination from the surface of the garment to the wearer’s skin or hair, or to other employees and family. The protective suit should be removed in a contamination-free space. Before taking off the protective clothing, it is advisable to clean the gloves and boots in order to prevent dust being thrown up. Masks and zip covers should be wiped clean too. Any protective items removed, such as adhesive tape, should be immediately disposed of in a chemical waste container provided for this purpose. With the protective gloves still on, the wearer should begin rolling the hood back, taking care not to let the outside of the coverall touch the head. Unzip the coverall and begin rolling that outwards, rolling it down over your shoulders. Place both hands behind your back and pull down each arm until completely removed. Sit down and remove each shoe, then roll the coveralls down over your knees until completely removed, ensuring the contaminated side is not touched and does not come into contact with clothing. Finally, discard the suit in the bag provided and remove your gloves. When discarding the protective suit, it is important to hold it by the non-contaminated inner surface in order to prevent contact with the hazardous substance. The process of removing the suit results in contamination of the workplace, so this area must be cleaned as well. Leaving the danger zone while still contaminated poses a risk not only to the wearer of the protective suit, but also to others who are not involved in the procedure. Sometimes the best way to learn is to practise. Reputable suppliers of protective coveralls will provide training for customers and distributers to spread the message of how to put on personal protective clothing and how to remove it correctly to avoid cross contamination. It is importantto remember that only people who have received specific training should be authorised to wear, remove and dispose of contaminated clothing.